EQUIPMENT rental for diving and snorkelling are available. Price 25EUR is for a complete flat, not per person! Apartments in the diving center: 70m2, 2 bedrooms, air conditioned,...Free WIFI available in the diving center. Across the street beautiful beach El Sawaki. NEU - roof terrace in the diving center with shisha corner, swing,,,,sea-view. TRANSFERS - from and back to any hotel in Hurghada city center is free. * We pick our guest in the morning from the hotel and after diving bring you back to your hotel. 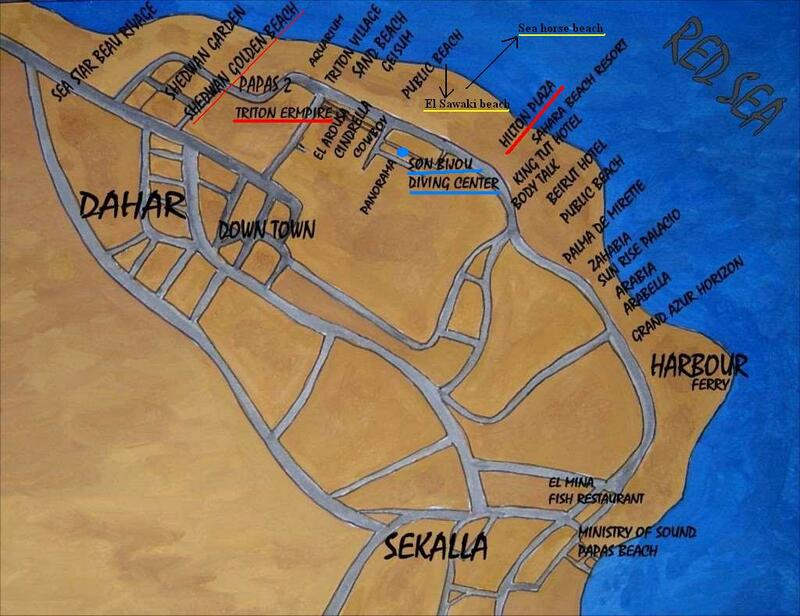 If you stay in hotel after Sekalla or in Makadi Bay, El Gouna,…we charge a small fee per car (not per person). We also offer a transfer from / to Airport. (through the Booking On-line tab on our web page)! Payment is made on the first day at our diving center. We only accept payment in cash: EUR, GBP, USD and LE (Egyptian Pounds). IMPORTANT!!!! Please look on our web page Tab Hurghada Info and go down the page till *Currency for our exchange rates ratio, thank you.